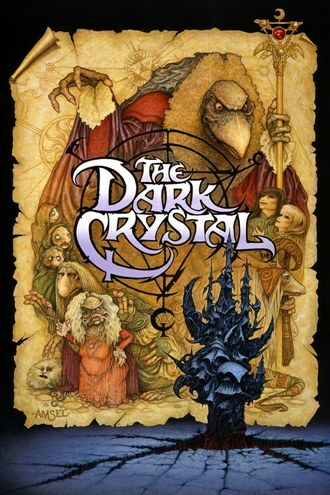 Jim Henson’s tour de force “The Dark Crystal” is an epic story, but leaves something to be desired. Why did the Muppet Man do this you ask? Because he felt that children should be scared at times. G.K. Chesterton was of the same opinion. 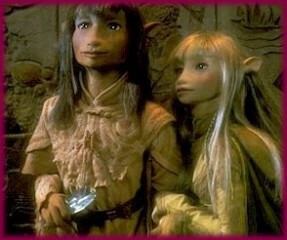 Now, The Dark Crystal is scary, but it is not a horror movie on the level of Coraline. Children may be frightened by the creatures that Henson made, but they will realize that they are not real. The images will not necessarily terrify children over nine — the minimum age level of viewers for whom I can recommend this movie. Note: the following contains story spoilers. Crystal takes place in the fantasy world of Thra, a world ruled by the Skeksis who use the magic of the crystal to sustain their lives. These evil, ugly creatures rule by fear, opposed by the gentle Mystics whose ways of “natural magic” attempt to balance the world thrown into chaos. The Mystics care for a young Gelfling (a Tolkien high elf-fairy hybrid-type creature) named Jen, who is the key to the restoration of the world. After the death of his teacher, Jen is sent to find the shard of the Dark Crystal, the source of the Skeksis’ evil power. If the shard is placed back into the crystal it will put the land back in balance. Jen, with the aid of a half-crazed astronomer named Augra and a beautiful lady Gelfling Kira, rushes to repair the crystal before the three suns align and grant the Skeksis immortality. The beauty of this movie comes from the marvelous technical mastery that Jim Henson and his associates built into this movie world. The way that it’s done, you could almost believe that this place and these people actually existed. There are some limitations of course, but the very fact that they tried something like this in the first place is remarkable. The amount of emotion they can get from these puppets is amazing. Jen is a noble, if simple hero, an orphan, presumably the last of his kind (like that hasn’t been done before). He is loyal and self-sacrificing — even though he does throw the shard away, he finds it and takes it where it needs to go. Kira is the beautiful and innocent maiden of many folktales who uses her connection to Jen to push him further in his quest, ultimately by her death (she’s brought back — shocker!) which gives Jen the strength to complete his mission. This movie delves heavily into the weirdness of Eastern mysticism. The Mystics are for all intents and purposes Buddhists. There is also heavy astrological content and a healthy dose of magic. Most of the magic that is seen is practiced by the Skeksis, who use it for harm, mostly to “zombify” innocent creatures (nearly including Kira). Kira herself can speak to animals and plants, though it’s unclear whether she uses magic or if this is a natural ability in her species. It is also revealed that the Skeksis and the Mystics are two parts of one creature, split when they tried to perfect themselves in their pride. Yeah, they really went there. At the end of the movie the two beings are merged again. They state that all beings are part of each other, heal Kira, then turn into beams of light and fly away. The creatures, especially the Skeksis and their minions, the Garthim, look quite repugnant, but that’s the point. The most unpleasant part is when one of the Skeksis straps the “pod people” (basically treasure trolls) and later Kira into a chair and uses the light from the Crystal to drain their life essences and wills to make themselves appear young again. I wonder if they consulted the Goa’uld on this. The Garthim, crab-looking monsters, attack and and hunt for Jen and Kira and capture the pod people. Kira is stabbed in the back and dies. Jen heals the crystal and the castle begins falling apart, because the rule of the Skeksis is over. Basically an assortment of creatures, are killed or maimed unpleasantly and a good time was had by all. Despite the cliche story, The Dark Crystal is a masterpiece of speculative fiction. The artistry and detail are wonderful, but the fact is that Mr. Henson should have paid more attention to the story. So while the story may lack … something … and Star Wars-style Eastern mysticism many seem troubling, fans of speculative fiction should at least give Crystal a look if only as a piece of art. Yeah, it was part of the kids SF/F movie renaissance of the eighties. You have it, Ladyhawke, The Black Hole, Dragonslayer, Flight of the Navigator, WarGames, and Labryinth. It was an unusual time where kids movies weren’t afraid to tackle serious themes. A great geek example of this is the movie Cloak and Dagger, although it’s more a thriller than spec fic. The mysticism is definitely a factor in the film though. I think the quiet horror of the ending scene works against the point they were trying to make about balance. As Christians, we believe evil and sin is fought by repentance, but the idea of evil being violently absorbed by good to me as a kid was chilling. One of Christianity’s strong points is that it explains evil without diminishing it nor people who practice it; it’s not an illusion or disease. YMMV on that last point. I don’t know. I find it worse to be little more than an illusion of self-consciousness, a drop in the ocean dreaming he has identity. Or that current evil is a karmic burden due to sins of a past life. The ending of the DC where the Mystics finally complete their long journey and forcibly absorb the Skeksis back into themselves to create these combined greater entities always unnerved me. It didn’t help that the entities were pretty hideous either. I think people don’t really get the fatalistic aspect of eastern religions. In the west, things like Buddhism are blended with general New Age positive thinking, but the reality I think is far more amoral and pessimistic than that.